Yes, a few years ago. Like many of my projects, it has sat around waiting for me to work out what to do with it for way too long. Turns out it really didn’t need much done to it at all. 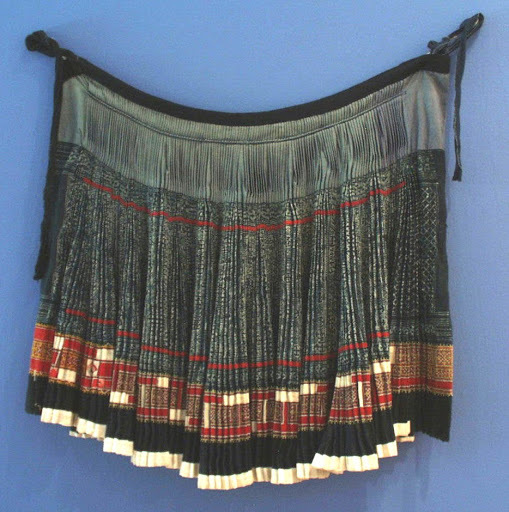 Originally it was a wrap skirt with a tie, you’ve probably seen this sort of thing if you’ve ever been to Thailand, Laos or Vietnam as the Hmong and hill tribe people often sell them in the markets. 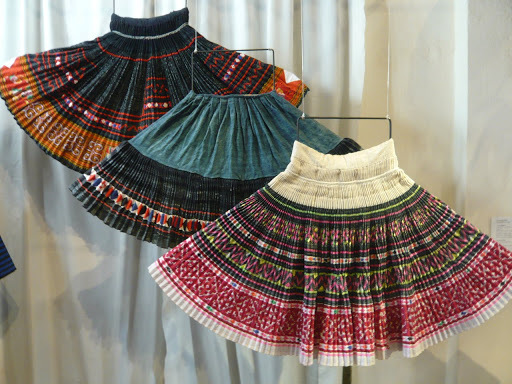 It looked sort of like this (I cut into it ages ago without taking a photo first, but here are some similar skirts at a costume museum in Luang Prabang). Needless to say, the resulting skirts are worn for a very long time (I’m guessing until they practically fall off the wearer in a heap of threads). Anyway, I just cut off the waist string and excess fabric on the sides, made a side seam with a zip, added a few darts around the waist, and voila! Is it weird that although this is an Asian garment, it reminds me of something Tyrolean? It’s probably because along with the traditional embroidery (on somewhat non-traditional turquoise polyester in the strip running across the middle of the skirt), all sorts of western ribbons have been sewn across the part that is pleated, as you can see. I’ve nevertheless gone for an all-out Asian look with this batik T-shirt which I fiddled with a while ago and some earrings which my sister got me from Laos and which I converted so I can wear them (simply attached a metal loop and hooked it over the back of the clip part of some clip earrings). My sister got me this bag too, which is made from recycled bits of weaving. 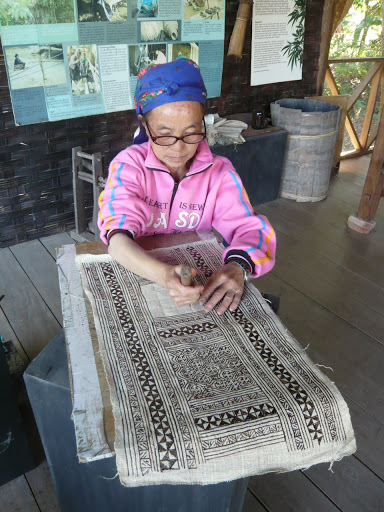 Considering the intricate patterns, I don’t even like to think how long it took to make the original textile! Oh, and shoes from Savers ages ago, I have not worn them anywhere yet as they’re a little tricky to style, as many of you have agreed. I’m still undecided about them! *Well, I thought she did. Turns out it was actually from Vietnam. Gahh! ← Happy hoppy new year! The skirt looks great! I'm always amazed at such beautifully and intricately handmade garments … incredible!It's been super hot and humid in Brisbane the past few days, I think I'm melting away … but I think the whole country has had enough natural disasters for many a year. Love the title of this post!I can't believe how much work goes into those skirts! Those women are amazing. Your skirt looks great!